Certificate of Merit San Francisco Film Festival; Certificate of Merit Chicago Film Festival; award-winner 1979 American Film Festival. 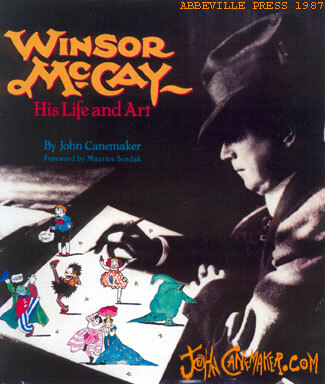 The life an career of the great cartoonist Winsor McCay is warmly recalled by his former film assistant, John Fitzsimmons (now 84); clips of classic McCay animated films including Gertie the Dinosaur (1914). "As a biography of a neglected American genius who profoundly influenced the art of animation,this film should be a 'must'." Film News, Nov/Dec 1976; "Film Tribute to Animator" Los Angeles Times, 26 May 1978. Distributor: Phoenix Learning Group, Inc., St. Louis, MO. www.johncanemaker.com © John Canemaker 2001, 2003. All Rights Reserved.